In the long run, it is better for us to anticipate and prevent problems than to profit from their reoccurance. All of our decisions and counsel should be based on the cost versus the benefits for our customers. In the end computers, no matter how cool, are simply tools. People--and the things they create--are the focus of our business. 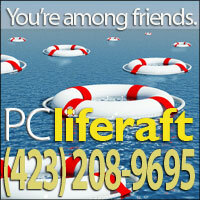 PC Liferaft LLC is a small company in Chattanooga, Tennessee owned by two "semi-retired" IT professionals. We both have many years of experience in a university system where demand for technology support tends to grow each year without any increase in resources to meet those needs. The proactive nature of PC Liferaft--identifying the root causes of problems and developing strategies to prevent them from reoccuring--comes naturally to us. We each hold regular jobs during the day that pay our bills, which is why we do most of our PC Liferaft work from late afternoon to evenings and on the weekends. It seems as if we are working all the time, but we enjoy it. Helping people and solving problems is what our business is all about. The former Director of Technology Support Services at the University of Tennessee at Chattanooga, Rodger Ling has done everything from answering phones at the Help Desk to overseeing million dollar grant projects. After several years he discovered that what he missed most about moving to management was the opportunity to help people solve their problems directly, rather than through policies and delegations. With his wife at the same point in her career, they sold their home and moved about a 35 foot sailboat with their young daughter for a two year sabbatical exploring the Caribbean and East Coast of the U.S. (see www.stationr.org). Motoring home up the river towards home, pondering the need to resume some sort of meaningful career, the idea that became PC Liferaft was born. "We started this business because we see a real need for a different kind of technology support company," Rodger says, "one that is proactively focused on preventing problems rather than profiting from them. I'm certain that's not the best business model for making money, but I'm convinced it will be the most satisfying in the long run." As business manager for a fortune 500 company, Jim Bowman was on the "bleeding edge" of computer innovation in the 80s and early 90s. Later he chose to use his MBA to teach these leadership tools, passing them on to his children’s generation. His phone has rung for a quarter century with those seeking his advice and his computing knowledge. That's probably because Jim focuses on the his client's productivity goals and minimizes the techie talk. We also like to think it's because he's a genuinely nice fellow. Jim brings financial, technical, and people skills to our humble company and generally tempers Rodger's "non-profit impulses." How long will you be without a computer while yours is being repaired? A turn-around time of one to two business days is considered typical in this business, but be aware that the need for speciality parts can slow the process for any company. If the repair takes longer, what will you use for a computer in the meantime? Who will do the actual work on your computer? Can you trust them with your sensitive information and valued documents? Trust can be a tough call to make, but it helps if the same person does the work each time and if the company has written procedures and safeguards. It may not make sense to spend $400 repairing an old computer when you can buy a new one for less. If you can't get a "no more than" estimate in advance (data recovery excepted), walk away. Solving computer problems is not rocket science, but it does call for a combination of logic and intution which can only come from experience. In our own experience in hiring computer technicians in higher education, it wasn't always the "whiz kids" who excelled; in fact, their over-confidence sometimes led to real problems. An experienced but thoughtful person who is not afraid to say, "I don't know, but I know how to find out," is almost always a better bet.